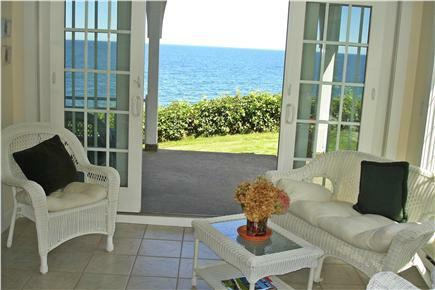 Step out onto the ocean porch from the cozy sunroom. Breathtaking view of Cape Cod Bay from living room. 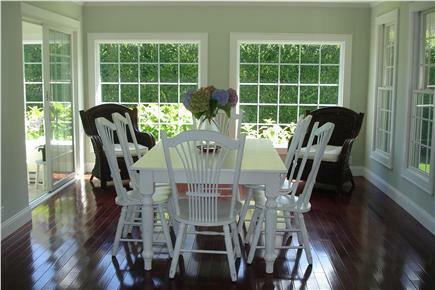 Lovely, spacious dining room with antique white Canadian table. View from bright, white kitchen looking into dining room. Listen to soft sounds of waves in ocean front master bedroom. 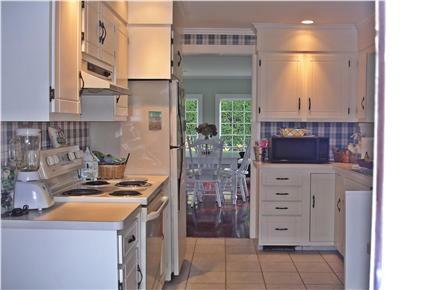 Beautifully maintained waterfront classic Cape Cod cottage with 3 porches and a private beach on Cape Cod Bay. 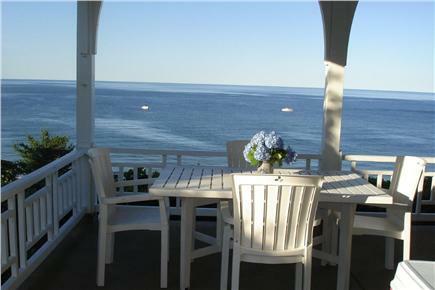 Experience the ambiance of ''Old Cape Cod'' in this home on a bluff overlooking the ocean in the lovely village of Sagamore Beach. This wonderful old shingled home has an ocean-front master bedroom with a master bath. 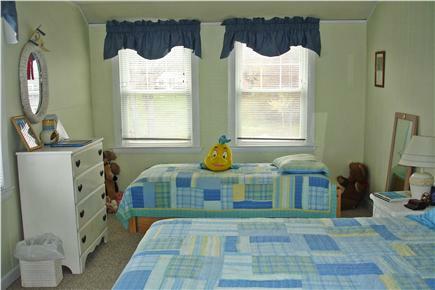 Also on the second floor is another bathroom and two additional bedrooms. One of the additional bedrooms faces the ocean and has twin beds. The other has a queen size bed as well as a trundle bed. There is a view of the ocean from every room in the house. 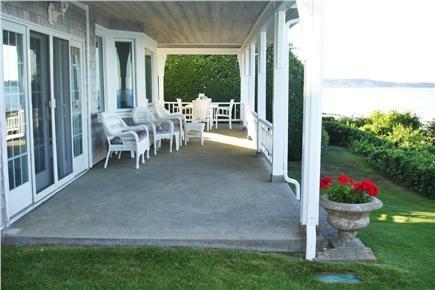 Sip a cup of coffee while watching the sun rise out of the bay from the ocean-front porch. The beach is below the house and easy to get to by steps just a house away from the front door. BBQ grill on side porch, washer-dryer in basement, dishwasher, microwave, coffee maker, blender, linens all included. 46'' flat screen TV in living room, TV in each bedroom, and high speed internet. Huge beachstone fireplace in living room. No pets. No smoking.There is a relaxing aura about this ''beach house'' bordered on 3 sides by porches with white wicker chairs and rockers. The tiled sunroom is perfect to observe the ever changing colors of the sea and sky on cool mornings. The newly enlarged dining room has an expandable table for entertaining. The kitchen, which boasts an adorable nook, is well equipped and has easy access to outside porch dining or inside dining. 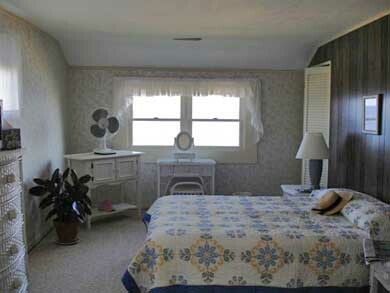 The bedrooms are light and airy and afford full views of the ocean and coastline. Sagamore Beach is close to the Cape's many attractions. Two golf courses are located just a few miles away. The Cape Cod Canal is a five minute bike ride from the house and affords the perfect place for roller blading, walking, and of course, biking. This property affords a truly wonderful place to anchor a summer vacation, or a spring, or fall getaway for a couple, couples, family and friends. Additional availability info: Rentals are usually Saturday to Saturday but flexible to suit client when possible. We are so excited to come to your awesome beach house once again this year.. Mom turns 84 on Wednesday, February 14th. and we are already making lists of what we want to bring so we don't forget anything.Hope you are well and having a wonderful spring. “Sagamore by the Sea” is a gorgeous water front home that provides literally everything you need for a family vacation. We first rented here in 2008 and have returned many times. Lynn and Gray are the ultimate hosts and have done magnificent renovation work over the years. 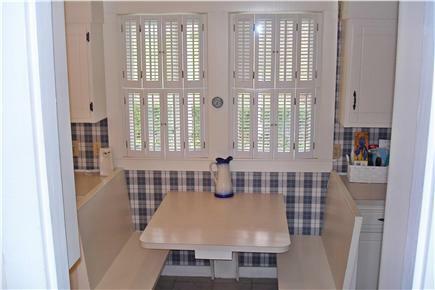 This is a beautifully maintained beach house in an equally beautiful neighborhood. The amenities far exceed most typical Cape rentals. The house is perfect for my wife and I with our son, daughter-in-law and two grandchildren. The spacious living room is ideal for conversation or a family movie night at home. The new open dining room has ample space and is a perfect spot for board games when you’re not at the beach. The comfortable sunroom is a great place to curl up with a book. All the bedrooms are spacious and filled with the fresh ocean breeze and soothing sound of the waves. We enjoy starting each day relaxing on the back porch while watching the sunrise over Cape Cod Bay. Then it’s a quick walk down the steps next door to get to the private beach. Everything you might need for a fun day at the water including plenty of beach chairs is readily available. This place truly is magnificent. Lynn and Gray have made us feel very much at home here. Thank You! perfect spot for a wonderful vacation getaway. "Our vacation stay at this beautiful beachfront home was delightful. The cozy, well-done interior with sprawling back and front porches provided the perfect settings for total relaxation. With easy beach access and the amenities provided, this house was the perfect family getaway with old-fashioned charm. Planning our return to this beautiful home is a definite!"